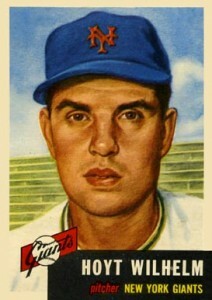 Hoyt Wilhelm revolutionized the role of the relief pitcher during his 21 seasons in the majors. He became the first reliever elected to the Baseball Hall of Fame and made people re-think the importance of specialty pitchers. For collectors focused only on the home run hitters for their collection, this list of the top Hoyt Wilhelm cards may have you re-thinking his importance in your collection as well. Even before starting his baseball career, Wilhelm made a name for himself serving in World War II. While fighting in the Battle of the Bulge, he was wounded and received the Purple Heart. He would pitch his entire career with shrapnel in his back, making his incredibly long career even more impressive. You can find a card in the 2007 Topps Distinguished Service insert set detailing Wilhelm's military service. 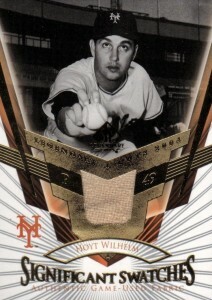 For collectors of knuckleball pitchers, Wilhelm has many cards that feature him holding the ball with his iconic grip. Take a look at the 2001 Upper Deck Legends of New York set and 2003 Fleer Fall Classic for great examples. A forgotten set, 2005 Upper Deck Reflections offers Wilhelm collectors a chance to build a rainbow for Hoyt's card (#198). Even today, Wilhelm's influence can be felt on pitching. He mentored knuckleballer Charlie Hough while with the Los Angeles Dodgers, who later taught the pitch to R.A. Dickey when Dickey was with the Texas Rangers. Hoyt Wilhelm did not begin his major league pitch career until he was 29, which helps demonstrate that it's never to late to start building your collection as well. The following list will direct you to the key Hoyt Wilhelm cards with a major factor being value. However, considering the large mix of cards for Wilhelm, collecting variety is also a key component. Hoyt Wilhelm pitched for ten different teams over his career and some collectors may want to try to piece together a collection featuring a card from each of his teams. Thanks to this 1971 Topps card, that is a possibility. 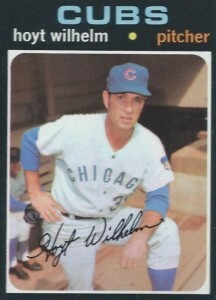 Even though Wilhelm only pitched three games for the Chicago Cubs before being traded back to the Atlanta Braves, his beautiful 1971 Topps card features him standing on the dugout steps in a Cubs uniform. Each of the other nine teams Hoyt played for have several trading card options for collectors to choose from. 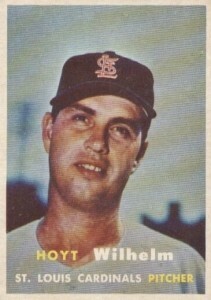 A common theme in several of Wilhelm's cards, including his 1957 Topps card and a few more examples on this very list, is that his baseball cap would sit unevenly on his head, with it tipped to the right side. Another idiosyncrasy of Hoyt's (and one that is common with knuckleball pitchers) is that his pitching wind-up did not appear to be very powerful. He would barely raise his left leg off the ground when starting his pitch and nearly all his power came from his arm slinging around to deliver the pitch. As you might suspect, more than 20 seasons in the majors results in a lot of game-worn jerseys. Because of this, Hoyt Wilhelm has many jersey relic cards, providing collectors a whole host of opportunities to pick one that features their favorite team. For the list, I selected a New York Giants swatch as that was Hoyt's first team and the one with which he won his World Series championship. Pittsburgh Pirates relief pitcher Roy Face and Wilhelm were given a combo card in 1960 Topps that covered their unique specialty pitches. While Wilhelm's knuckleball pitch could end up crossing the plate anywhere, Face was famous for the forkball which would drop suddenly and could end up hitting the ground without even getting to the plate. 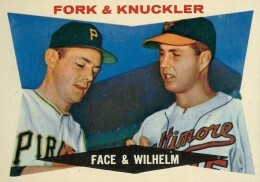 Two sets later, Face and Wilhelm would also share another card in the 1962 Topps set. 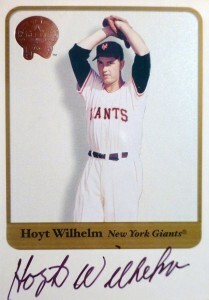 Although Hoyt Wilhelm passed away in 2002, he does have certified on-card autographs in several sets. You can't go wrong with any of the autographs from the Fleer Greats of the Game sets and this 2000 card has added appeal because of the large signature area included in the design. 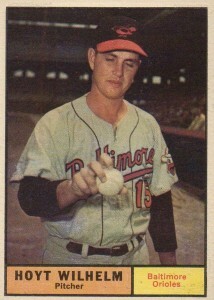 My personal favorite Hoyt Wilhelm card can be found in 1961 Topps and features him demonstrating his knuckleball grip. Knuckleball pitchers each have a unique style and Hoyt used a two-finger hold to push the ball out of his hand. 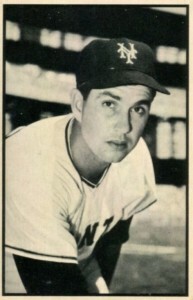 During Wilhelm's days with the New York Giants, he and catcher Ray Katt set an unfortunate record by allowing four separate passed balls in a single inning. It is a record that has been matched twice since, also by knuckleball pitchers. Perhaps this is why Wilhelm appears a little more somber in his 1953 Bowman card. 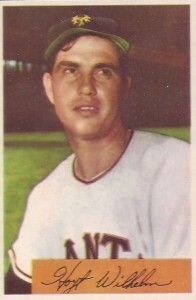 Hoyt Wilhelm made his only career playoffs appearances with the Giants in 1954 as they made their way to the World Series title. Hoyt pitched in two games and recorded a save in Game 3. The series turned out to be a quick sweep of the Cleveland Indians that is best remembered by Willie May's famous over-the-shoulder catch. His 1954 Bowman card showcases an appealing look that offers a noticeable contrast to the black-and-white image from the previous year. Hoyt's most beautiful card is certainly his painted 1953 Topps card and you can find variations of this card with black or white lettering on the reverse. 1953 also saw Wilhelm named to his first All-Star game Unfortunately, he was not given a chance to pitch during the game because it was believed that none of the catchers on the team would be able to handle his knuckleball pitch. 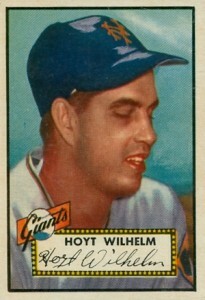 Hoyt Wilhelm's first baseball card appearance is a short-printed inclusion in possibly the most famous baseball card set ever made, 1952 Topps. That's not a bad way to start a baseball card career in terms of value and he started his pitching career just as well, going 15-3 in his rookie season and finishing second in the Rookie of the Year voting. 1955 Golden Stamps Hoyt Wilhelm PSA 4 VG-EX "Nice Card"